Outstanding holiday accommodation on the beachfront. Marina of La Napoule. The interior of our holiday apartment communicates with a beautiful covered terrace of 12 square meters which faces the sea and offers a magnificent view. 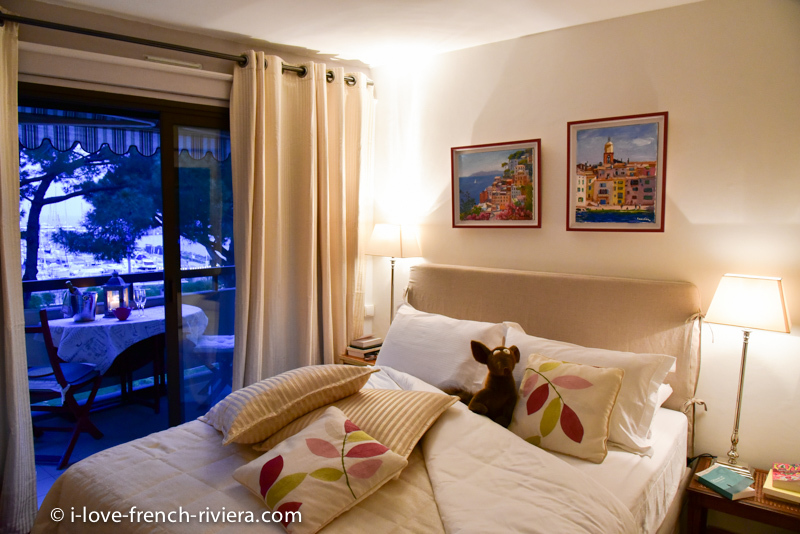 Part of our holiday apartment at the Marina of La Napoule on the French Riviera. 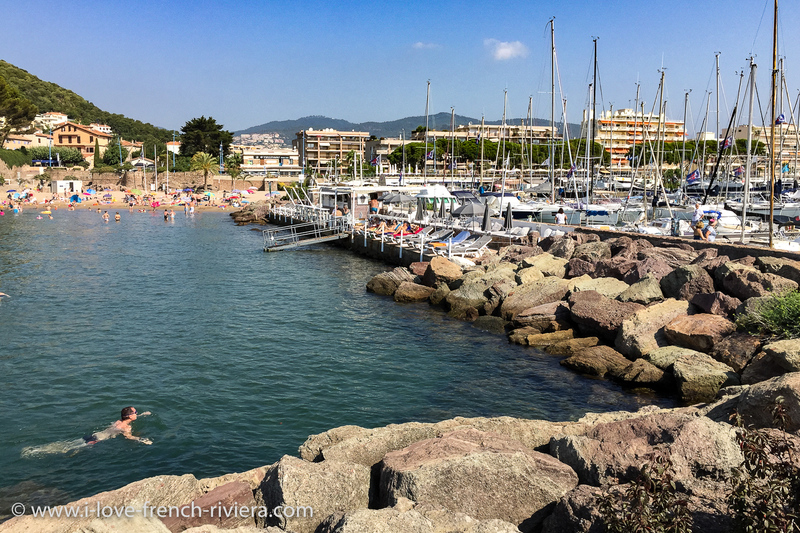 The marina of La Napoule and the castle beach are right in front of our residence. A privileged environment with beautiful landscaping and amenities to swim and rest. In La Napoule, a pleasant path runs along the shore and goes from beach to beach with great views over the sea and castle. 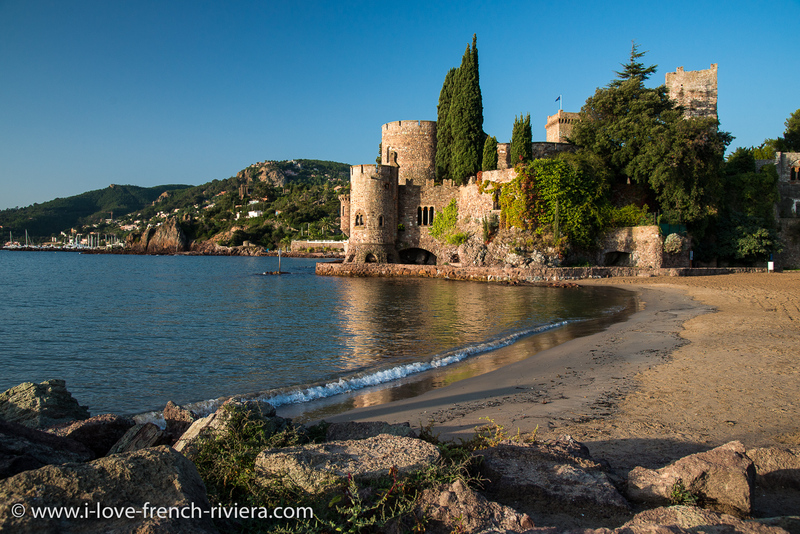 The beach and the famous medieval castle of La Napoule are just in front of our apartment. Picture taken in the morning at 08:30. 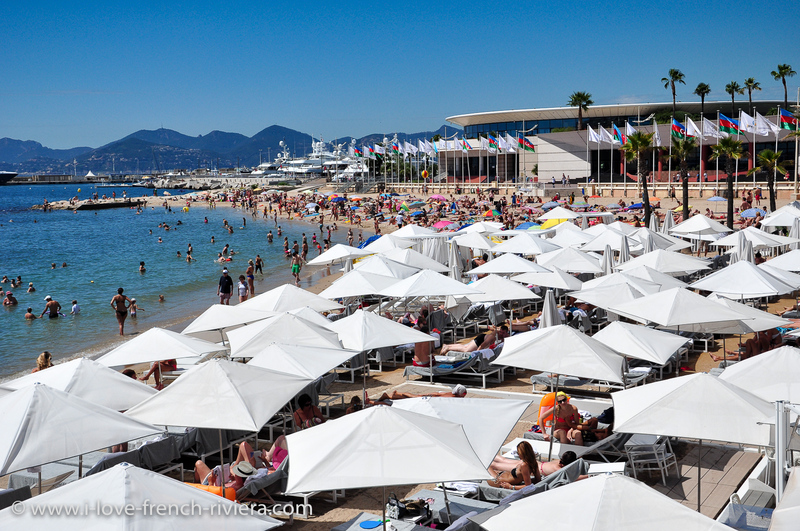 Cannes and its famous Palais des Congres, the Croisette and its beaches are easily accessible. Just take the bus #22 in front of our holiday apartment in La Napoule. Welcome to the French Riviera! Everybody has heard of the French Riviera, a paradise for a great vacation in any season, even in Winter. The Mediterranean sea so blue in all seasons, its beautiful light, the atmosphere so pure ... 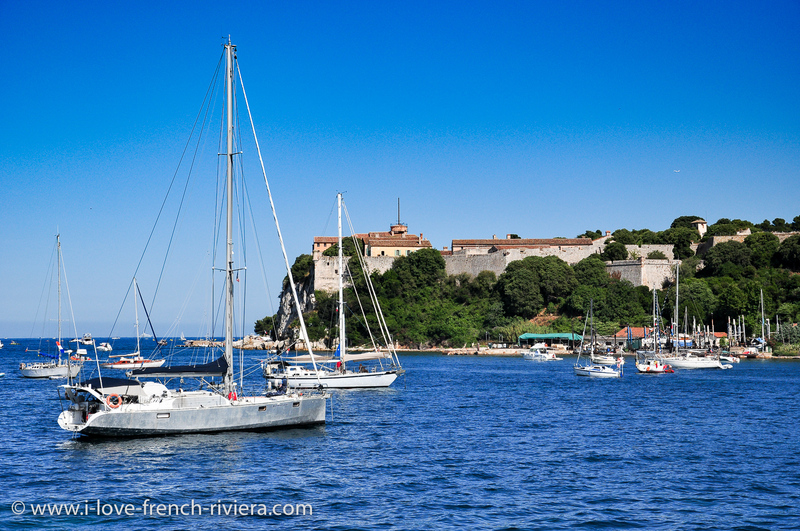 The French Riviera is a sunny region with a mild climate, known all around the world. It was the British who first, made it their favorite residence in winter, by the mid-nineteenth century. 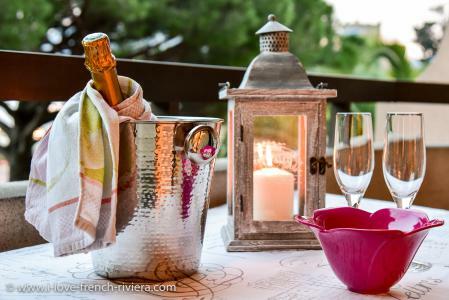 After developing 15 exceptional apartments in the Alsace wine region and villages straight out of fairy tales, we are pleased to present our first holiday accommodation on the French Riviera, at La Napoule (bay of Cannes). 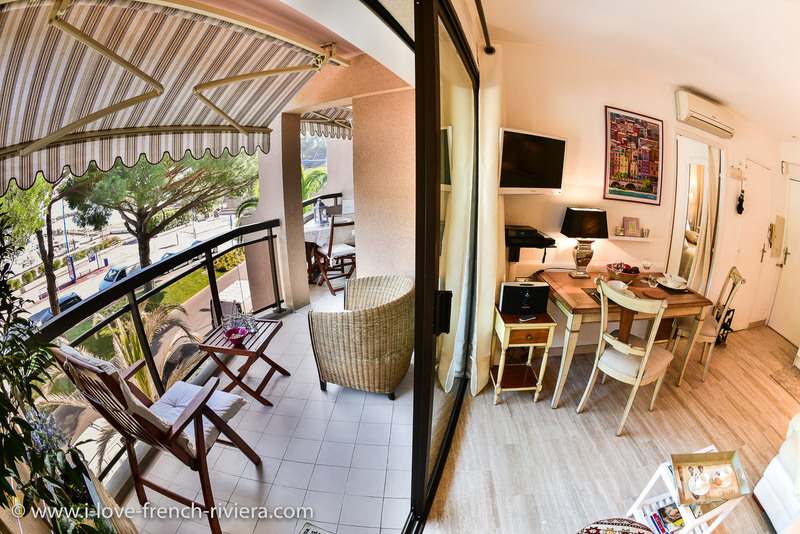 An outstanding apartment facing the beach, the harbor and the castle of La Napoule, a truly stunning location! La Napoule enjoys a privileged location at the south-western end of the bay of Cannes geographers also called the Gulf of La Napoule. The site is sheltered from the prevailing winds by the Esterel Mountains. In this part of the bay, the sea is almost always calm and offers a safe anchorage for boats as well as easy access to the hinterland. That's why, since the Middle Ages, the lords, pirates and other kings vied relentlessly control of La Napoule site. The turbulent history of the castle of La Napoule is here to testify! This outstanding strategic location has now become an asset to the quality and enjoyment of your stay and your vacation: sunny location, sheltered from the Mistral but with immediate access to the superb Esterel Mountains; many sheltered beaches and coves; calm sea for a safe swim and enjoyable boat outings. Icing on the cake: From La Napoule, you are only 7 kilometers from Cannes (TGV) and 35 kilometers from the airport of Nice Côte d'Azur. Rejuvenate, enjoy the mild climate and redo your health! It was the British who started tourism on the Côte d'Azur. They began to settle in the winter to enjoy the mild climate and that in the eighteenth century! The phenomenon is greatly amplified in the nineteenth century with the appearance of the train. To recharge first ... The first reason for the popularity of the British for vacationing in the county of Nice and Provence was originally medical! The therapeutic properties of the climate of the Riviera were quickly elevated to "medicine". Spend the winter in the south, in a beautiful natural setting and constantly green, between people of the same condition was imposed gradually for granted in English high society. Two centuries later, it is not necessary to belong to English high society to benefit from the virtues of the mild climate of the Riviera in winter! Only 7 kilometers from La Napoule, in Cannes, there is even a beautiful wellness and thalassotherapy institute. So come and relax! Mimosa - Acacia Dealbata - is an evergreen tree to 10 m high from the family of acacias. It was imported from Australia in the mid 19th century by the English who made the French Riviera destination fashionable. Mimosa acclimatized very well to Tanneron slopes and now covers all its hills. Bright yellow flowering occurs in winter and transforms the landscape. Mandelieu is specialized in the cultivation of mimosa and became the capital of the mimosa. Every year in February, stands the splendid Mimosa Festival. The Mimosa Route is one of the highlights of your stay in winter: 130 km of delightful scenery between Bormes-les-Mimosas and Grasse, via Le Rayol-Canadel, Sainte Maxime, St Raphael, Mandelieu La Napoule, the Tanneron and Pégomas. A must do from January to March. Mandelieu la Napoule, as a well-known Mediterranean coast resort offers many advantages of a seaside destination first. With 3 km of coastline, the resort offers its visitors seven beaches, sandy beaches and coves of characteristic Esterel Mountains red rocks. The labelled Nautical Station, Mandelieu La Napoule invites you to the pleasures of water sports in all their forms: boating, scuba diving, windsurfing, etc. These numerous and diverse activities are accessible over a long period of the year thanks to the particularly favorable climate and exceptional waters of the Gulf of La Napoule. Just out of the apartment, cross the boulevard and you are at the main marina. The ferries from Compagnie Maritime la Napoule are starting there and will take you out for some wonderful cruises and excursions to Sainte-Marguerite island that can be seen in the distance, to the Golden Corniche which will allow you to discover the Esterel from the sea, or to Cannes, St. Tropez and even Monaco! In Mandelieu-La Napoule was created the first golf course on the French Riviera: the golf course "Old Course" was born in 1891. With the "Riviera Golf Barbossi" created exactly a century later, three courses (two 18-hole and 9-hole) are plotted on the territory of the Mandelieu-La Napoule. With other courses in the area nearby, Mandelieu-La Napoule is truly a major golf destination on the French Riviera. To be discovered throughout the year and especially in winter when the golf courses of the North of France and Europe are not always accessible. Antibes, Nice, Monaco, Menton, Saint-Raphael, Saint-Tropez … so many familiar and famous names that evoke the most famous seaside resorts of the Riviera and which are easily accessible from the nearby Mandelieu La Napoule station. Mougins, a medieval village with many workshops of paintings and art galleries; Bar-sur-Loup, medieval village in the hinterland of Grasse; Callian, hilltop village in the country of Fayence. The village is dominated by its castle around which the narrow streets lined with old houses are wound. Mons, an old Provencal village is located 814 meters above sea level. Belvedere and exceptional view of the French Riviera. Tourrettes-sur-Loup, fortified village located on a rocky outcrop with a nice view. Saint-Paul de Vence, known for its many art galleries and the Maeght Foundation is a feudal village that hosted many artists and writers. To explore the villages of the hinterland, you will need to have a car. Martine & Jean-Paul Krebs - What about us ? 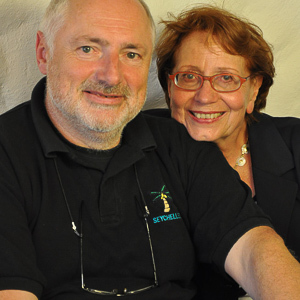 Rosa Gallica is our family business through which we design and operate our apartments. Our philosophy is that your stay in one of our apartments has to be a highlight of your stay! We think that - especially for a rather long stay (most of our guests are discovering the slow travel concept and are staying 7 nights and more) - it is not enough to sleep well during the night but it is necessary to enjoy the stay in a place which is somehow of the same level as the historical surroundings, the sea and the mountain: beautiful. 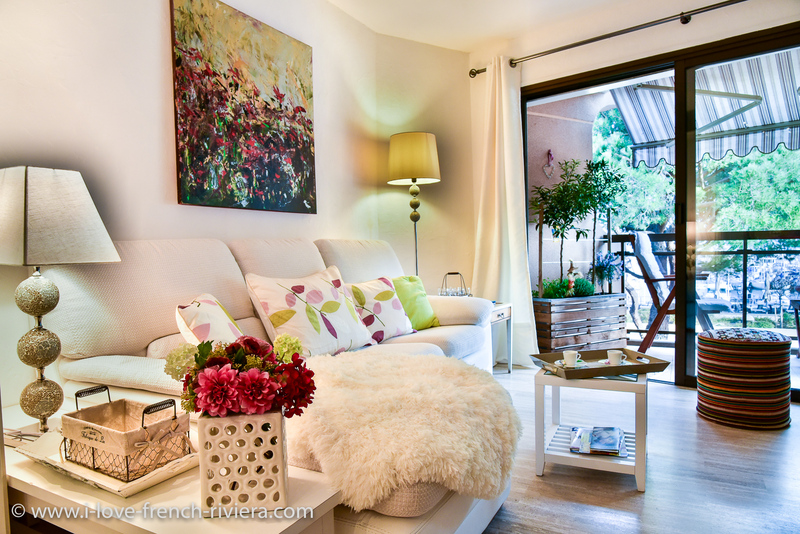 We put a lot of effort and care in the renovation and decoration of our vacation rental apartments because we want our holiday homes to be a memorable part of your travel experience to France. Outstanding location. 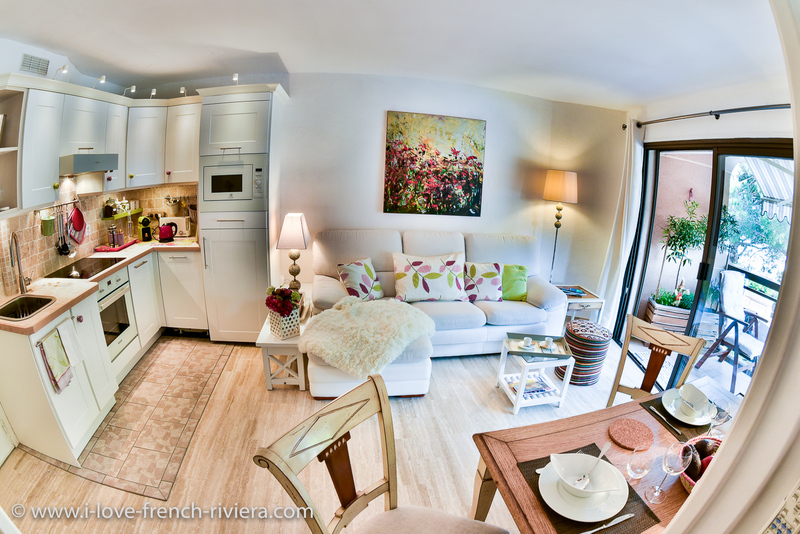 Bright apartement with beautiful sheltered terrace facing the marina and the beach. Swimming pool. Lift. 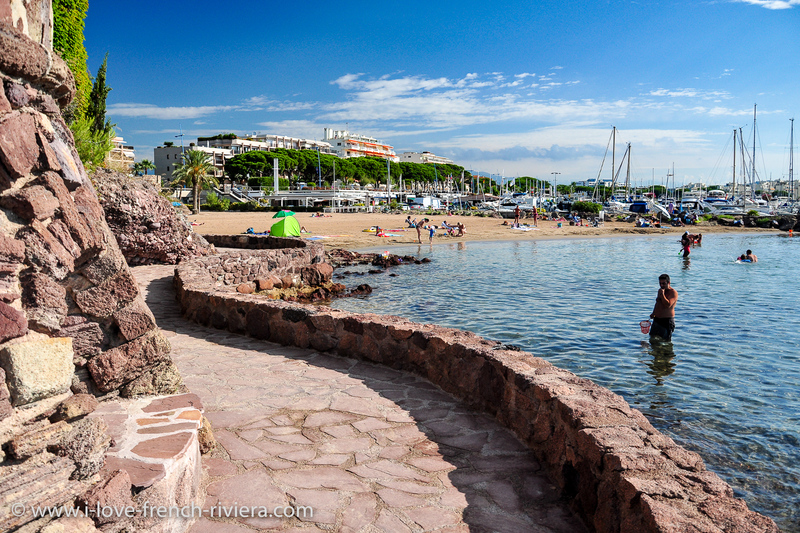 Beach, marina and castle of La Napoule immediately nearby. Holiday apartement fully renovated and decorated in a lovely secure residence.